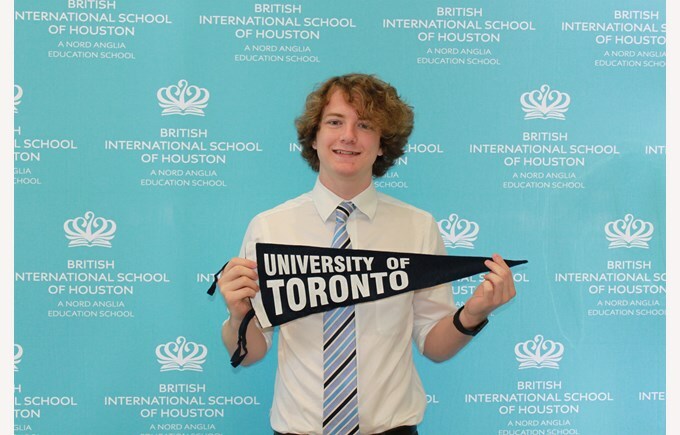 Katy, TX News (May 3, 2017) – Alec, a year 13 student at the British International School of Houston has been awarded one of the world’s most prestigious scholarships, the Lester B. Pearson International Scholarship at the University of Toronto. The school is located in Katy off of Westgreen Blvd. and Franz Rd. The University of Toronto is currently ranked No. 1 in Canada and No. 16 in the world. This is University of Toronto’s most prestigious and competitive scholarship for international students and includes tuition, books, incidental fees, and full residence support for four years. The scholarship provides an unparalleled opportunity for outstanding international students to study at one of the world’s best universities, in one of the world’s most multicultural cities. Alec will complete his International Baccalaureate studies this summer and enter University of Toronto’s Computer Engineering program this fall. The scholarship program is intended to recognize and attract the world’s brightest students who demonstrate exceptional academic achievement and creativity and who are recognized as leaders within their school. A special emphasis is placed on the impact the student has had on the life of their school and community, and their future potential to contribute positively to the global community. Students at the BISH have access to the very best education including taking the International Baccalaureate (IB) programme that can lead them to some of the highest-ranking universities around the world, with successful pathways to scholarships. This is a demanding academic program and is widely recognized to be the most rigorous course of study for students. The IB is considered the framework for an international education that goes much deeper in meeting the needs of the changing world and is attributed to student academic success extending to the university application process. The BISH Class of 2017 are also celebrating university offer successes including Columbia University, Cambridge, Southampton, Newcastle, University College London, University of Glasgow, University of British Columbia, Baylor and University of Tulsa amongst others.